There was a time when I would ride my bicycle into town, thinking that the portly physique I had in those days would never be able to convey me any further. Then one day I fell in with the right crowd (long story – I’ll tell you about it another time) and found myself doing 50-mile rides around Surrey. When you combine these two distinct parts of my life, you have, broadly speaking, the collective routes of the Olympic road races and time trials. I witnessed parts of these races by the roadside. Jen and I walked from our flat to the mini-roundabout on Fulham Palace Road, where we cheered the men’s road race rolling towards Richmond Park like a procession of dignitaries. A few days later I watched the women’s time trial in Hampton Court. But it was seeing the roads I know well on TV that had the most impact on me. Staple Lane’s steady ascent, the hairpins on Box Hill, the punchy little climb after Box that Gilbert was the first to tackle – they are only tarmac strips bordering fields, but these are the places that broadened my perspective on how far and how hard I am able to ride. They made me. It was like seeing your first kiss, your old friends, jobs you once had – or lost – gathered together behind the Perspex screen, depersonalised by the context of the race, and all the stranger and more moving for it. On Monday, I did my usual 70-miler through the Surrey hills. I do the same ride regularly because, regardless of whether I’m planning to race or not, losing myself for five hours a week does my mind a bit of good. I have wondered over the years why more people don’t do the same. This time, I saw the messages that fans had painted on the roads before the pros raced by. 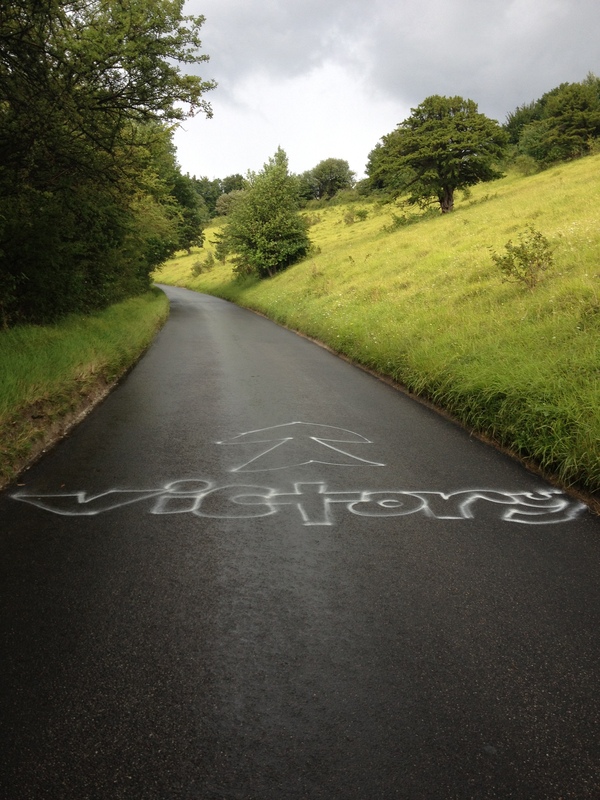 One, on Box Hill, reads: “This way to… victory”. And I like to think this kind of graffiti is a victory in itself: a permanent reminder of cyclists’ presence on these roads, and invitation for others to join us and be changed. This entry was posted on	August 8, 2012 at 3:11 am	and is filed under Uncategorized.